Eighteen letters, telegrams, photographs and paper items from the internment camps of Irgun and Lehi exiles in Africa. Gilgil (Kenya), Asmara (Eritrea), Carthago (Sudan), Tel Aviv and Johannesburg, 1945-1948 [most of the letters are from the camp at Gilgil, from 1948]. 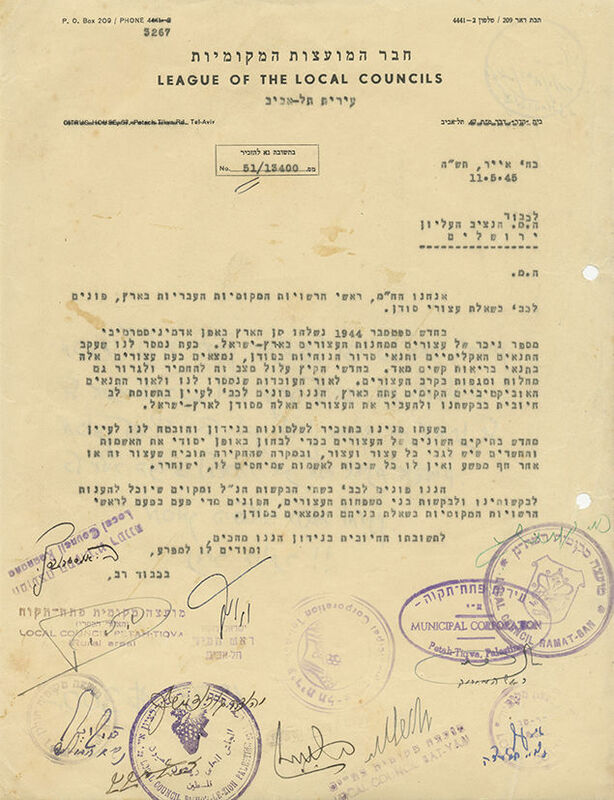 • Letter from May 11, 1945, sent by eleven mayors of Jewish cities and towns in Palestine to the High Commissioner John Vereker, with an urgent request to transfer the inmates of the African camps back to Palestine. Stamped with ink stamps and signed by each of the mayors of the following cities: Tel Aviv, Ramat Gan, Rishon LeTzion, Petah Tikva, Petah Tikva (rural area), Bat Yam, Kfar Saba, Holon, Ra'anana, Herzliya and Afula. Typewritten on official stationery of the "Union of Local Councils". • Letter from March 28, 1948, sent by the "camp representative" at Gilgil, Shmuel M. Katzenelson (Shmuel Tamir) to a member of the Tel Aviv Municipality, H. Ariav. The letter expresses the apprehension of the detainees following the arrival in Kenya of the English officer Roy Farran, murderer of Alexander Rubowitz, accompanied by two deserters from the English army. • Four handwritten letters sent by detainees at the Gilgil camp to Palestine in February-April 1948. The letters concern life in the camps, receiving newspapers and news from Palestine, sports competitions, the visit to the camp by Chief Rabbi of South Africa Louis Isaac Rabinowitz, and other topics. One of the letters is addressed to the "Le'Asireinu" ("For Our Prisoners") Society (which assisted Jewish prisoners and detainees), concerning the "disappearance" of moneys sent to detainees. • Telegram sent from Tel Aviv in March 1948 by Rabbi Louis Rabinowitz to the Jewish inmates at Gilgil camp. The telegram tells of a U.N. resolution to return the inmates to Palestine no later than May 15, 1948. • Certificate issued to Irgun member Chaim Tsines on behalf of the "Exile Camp Representatives". The certificate attests that Tsines "was detained at the Zion Exiles camp in Kenya and left for the homeland with the last exiles". It is dated on the bottom: "Eve of the closing of the Gilgil exile camp, 27 Sivan [June 4] 1948". Marked with an ink stamp of the "Directorate of the Jewish Exile Camp, Kenya". • In Exile at Asmara, Quarantine Camp, Asmara, Eritrea. 22 Nissan (April 23) 1946. Issue no. 124. Single leaf in handwriting, in newspaper format – review of an attack on military camps and courts in Palestine, report on the proposal to return Mufti Haj Amin al-Husseini to Lebanon, the burial of one of the detainees and other topics. Written on the reverse of a certificate used by the Italian army. • In Exile in Sudan [...] Cathago Internment Camp, Sudan Desert. 4 Nissan (March 18) 1945. Issue no. 38 (107). Two leaves, typewritten and mimeographed, in newspaper format – review of the capture of detainees who had escaped from the camp, the inauguration of a Torah scroll at the camp synagogue, news from the war fronts in Europe and other topics. • Two uncut sheets, one in Hebrew and the other in English, of notes with propaganda slogans protesting the deportation of Jews to African camps. • Two group photographs of detainees at the Asmara camp. Enclosed: two envelopes of letters sent by detainees at the Gilgil camp in 1948, one to Palestine and the other to Paris. Size and condition vary. Good-fair overall condition. Stains. Folding marks, filing holes, tears and open tears (mostly small and restored) to some items.